Now she is happy to earn some money. It makes her feel more independent. She works hard, hardly ever touches the tea cup her employer put on the table for her. 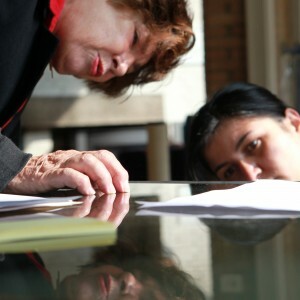 Now that she and her family have the right to stay in the Netherlands, she would like to get a legal job and pay taxes. She is happy she never has to be afraid again. She is studying and hopes to get a job in a nursing home.By looking at her work and looking at the pictures I realized how hard this work is. Before I started taking pictures of people cleaning, I must say I never gave it that much thought. During two months I took pictures of working men and saw they were almost always standing, sitting and pushing buttons to make machines do the work. Doing household chores people have to bend and stretch their bodies all the time.